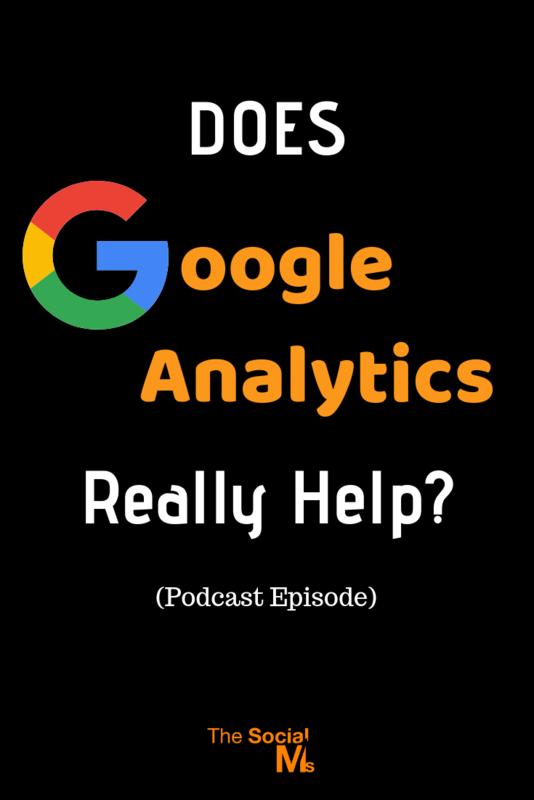 Google Analytics is a very powerful tool – but it’s also an addictive and time-consuming piece of software – and if you check it too often, it can become a problem for your business. In this episode of Marketing in Minutes you will learn, why and when you should not look at your analytics tools – especially Google Analytics. Here are some articles on how to use Google Analytics right! Below is the transcript for today’s episode of Marketing in Minutes. What’s the first thing many online entrepreneurs do in the morning? Or the last thing they do in the evening? And what they do the most in between? For many, many entrepreneurs, it’s checking some stats – opening Google Analytics, checking the number of social shares, or some other data they are collecting. And they lose a lot of time doing that. You are listening to Marketing in Minutes by The Social Ms – the podcast that gives you everything you need to know about one Marketing topic per episode. I’m Jonathan Gebauer and today, let’s talk about when not to check your analytics. There are a couple of marketing wisdoms successful entrepreneurs always talk about. One of those things I always recommend to everyone is to collect and regularly check every little piece of data you can. And that is that you can become addicted to checking your marketing data. And to tell you the truth, I believe that every single entrepreneur is addicted to checking data. You know what I did this morning? I woke up, took my mobile from the bedside table, and checked the real-time stats. Ok, site is running, traffic is normal – so let’s have a quick look at the stats from last night. Before I even get out of bed, I’ve already wasted 15 minutes in Google Analytics. Oh, and the last time I had checked everything was yesterday evening. And seriously, I wouldn’t have needed to do this: It’s really not necessary. If the site has problems, someone will call me or at least write me a message. And I usually don’t get any new usable data in the 6 to 8 hours I sleep at night. And that’s where the problem is: Google real-time stats are incredibly addictive – but the amount of usable data I get from these is minimal. All of us online entrepreneurs are probably guilty of losing too much time in due to checking stats. And it’s not just Google Analytics. As marketers, every single tool seems to give us more stats – and when we get more stats, we start wasting time by checking them too often. I’ve seen marketers lose more than half of their day in Analytics tools – and then complain that they have no traffic. It really doesn’t matter how many clicks you get from search engines in the last half hour. It’s not important, if you get two or three clicks on the link you tweeted. Your current A/B test won’t have usable results if only 5 people saw the landing page you’re checking. All of this is not important – and if you are checking anyway, you either have too much free time, or you are simply addicted too checking your data. And there is a big problem with that addiction: It keeps you from doing the stuff you should do. This morning, I should have started with typing the script for this episode of this podcast. Instead, I easily lost 15 to 30 minutes of my day, gaining absolutely nothing. And that is where the whole thing becomes really problematic – as an entrepreneur, the one thing you don’t have is time. So here is what you should do instead. All those data gathering tools we use are mostly set it and forget it tools. This is especially true for Google Analytics which basically collects a crazy amount of data for you to dive in and check when you have a specific question. So let’s say you are working on optimizing your SEO results. So what you do is open up Google Analytics and check your SEO data… but only once. You use that data to decide on the changes you want to make. Then you close Analytics and make those changes. And then you wait – you don’t need to look into that again for the next week at least. You won’t see any usable changes between now and then. And the same principle more or less applies to any other data gathering tool. If you set up an A/B test with a tool like Leadpages, and you only have 200 pageviews on your blog a day, it will be weeks before you have a usable result. So don’t waste your time checking the results every half an hour. Find something else to work on and you’ll be surprised how much you can finish in a single day. So what about you? Are you a crazy case of Google Analytics addiction? Or do you waste time in a different tool? And how do you deal with that? How do you stay productive? Check out the show notes of this episode and let me know in the comments! Thank you for listening to another episode of Marketing in Minutes – check out the show notes for more information on today’s topic. You can find them at blog.thesocialms.com/MiM-36… that’s blog.thesocialms.com/mim-36. Subscribe and come back for the next episode, and if you want to help us get more subscribers – leave a review on Apple podcasts.